I’ve changed first-thing-in-the-morning weekday roles with Petronela since school finished for half-term. When she was going to the school at which she taught for eleven years she was generally up first and made her coffee and my tea and I stayed in bed, out of her way, until she came back into the bedroom to get ready for school. At weekends and holidays it was usually I who got up first and took her coffee to her much later. I did manage to stay in bed till 5.30 this morning, half an hour later than yesterday, but as I want to drink my tea before I do anything the roles have reversed and now I take P her coffee at 5.45. I think it’s going to settle down like this as she likes that 15 minutes more in bed. As it now looks as though I’ll be driving her to school for a while longer, as the school asked her to go back and she cannot realistically get there on public transport, I’m going to have to think about coming home for a few hours on some days; there are jobs now piling up which I cannot do in Wetherspoon or the library. I have to come back on a couple of days next week for medical appointments so I’ll probably do a trial run this week to see how it goes. Not a lot to say about today. Monday seems to be exceptional in Wetherspoon as there were not as many people in as yesterday. The male half of the couple I mentioned yesterday arrived at 9.05 and I had to tell him that I had not seen the lady. I had thought they were man and wife but evidently not. I saw her later on the way to Wetherspoon. 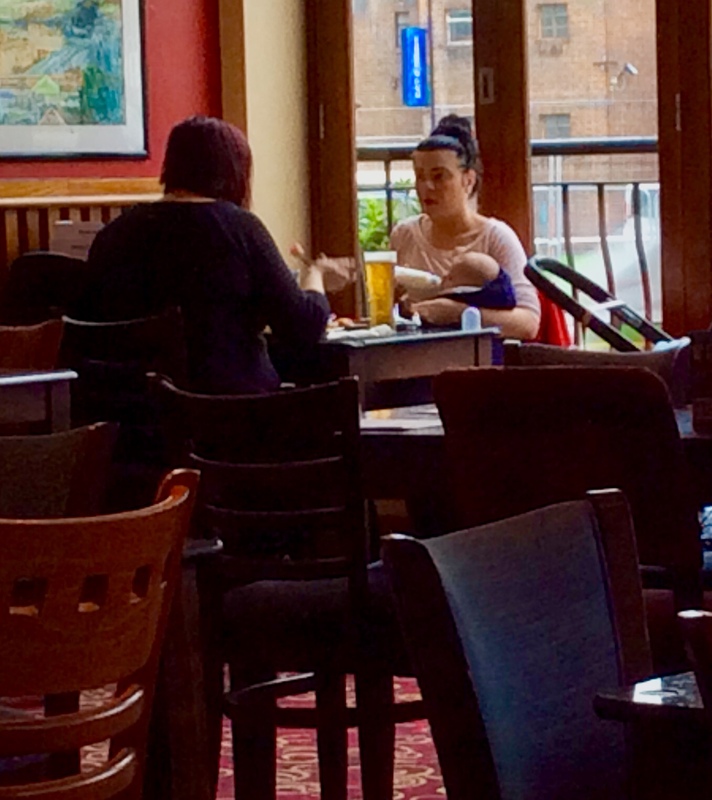 I was surprised to see a young mother feeding her baby with a beer close by at 9.30 in the morning. I had thought of going to Haworth today and brought a camera with the intention of trying to capture the moors behind the Brontë sisters’ home as they evoked it. It didn’t work out; perhaps another day. I would have liked to get in to ‘The picture house’ to get some pictures but it doesn’t open at a time I can do that so I had to be content with the outside. 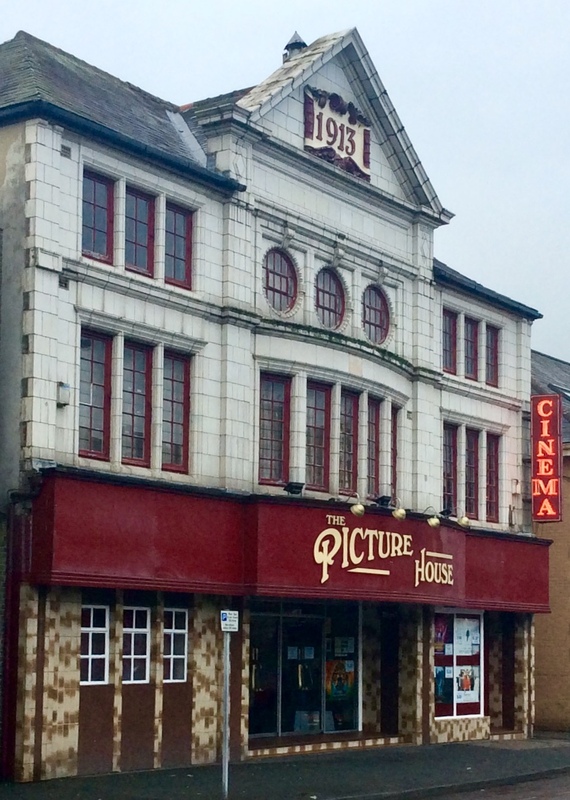 When I was a child we still called the cinema “the picture house”. Later, as a young teenager I didn’t do the usual ‘job’ delivering newspapers but was, at 14, ‘assistant projectionist’ at a local ‘picture house’ after school. It no longer exists. 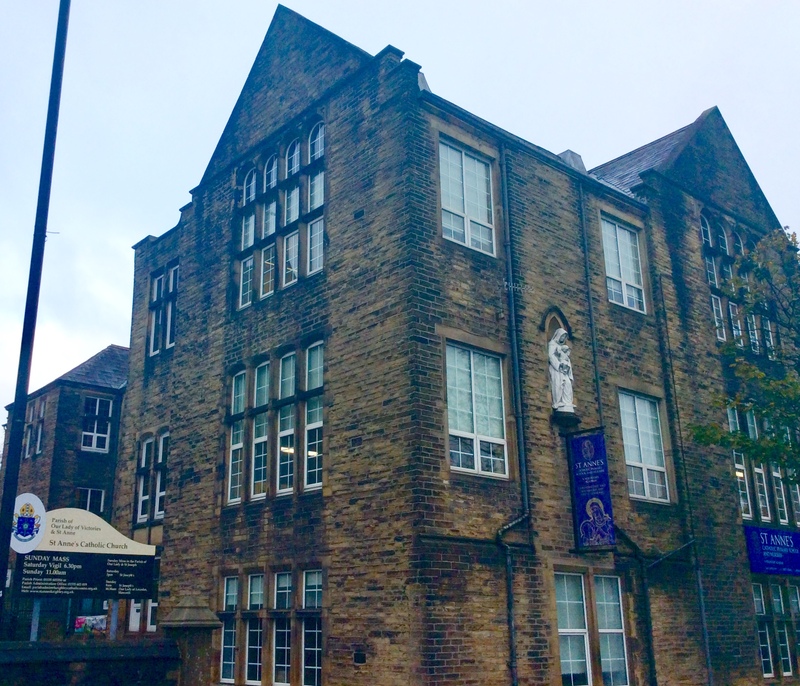 Just opposite the picture house is St. Anne’s primary school. I used to go there not long after I came back to the UK after Romania to help Romanian immigrant children who didn’t speak English to settle in. I park the car close by now while I’m in Keighley. At least she was allowed to feed her baby in the pub. I assume (perhaps wrongly) this was not breast-feeding, but even with prepared foods, some pubs or their customers would be sniffy. When I lived in Leyton there was a superb Wetherspoon’s next door in Walthamstow. This was in the fairly early days of the company. The ban on piped music encouraged people to come in and chat more, so it was a very friendly, chatty place and noticeably wide in its clientele: it was a place anyone could feel comfortable in, male or female, young or old, white or black. A Wetherspoon’s I visited from time to time later when attending work meetings in Manchester had the same character. In Merthyr Tydfil, in amongst the worst urban decline I’ve seen in the UK (or anywhere bar Bulgaria perhaps), the Wetherspoon’s was lively and the ONLY food outlet I could find! Some, though, like that in Chelmsford, are really eateries with lots of beer without the community and social feel of a good pub. One has recently opened where I live, Harwich, and it distinguished itself by (1), two members of staff not knowing how to charge for a half pint and saying “I don’t think we do that” and by, I’m told, delaying a meal for a couple with a child for an hour or more and then telling them because of the time, the child would have to leave. Like many innovative companies, as it expands it risks losing what made it special in the first place. Hi. That lady was feeling with a bottle but yesterday (30 Nov) a young woman sat next to me with a little one – cannot have been more than a month old – and did breast feed the babe. Didn’t bother me nor anyone else, clients or staff. I guess how the pub and staff perform is down to the manager. Certainly the Keighley one is a friendly sociable place, in fact in the morning it seems to be more of a social club than a pub, and the other Wetherspoon with which I am familiar, Skipton, Is fine – we sometimes have Sunday lunch there, unpretentious and low cost. The beer’s good too. How far is Petronella’s work from home? Maybe she can drive back home with public transport and you pick here up closer home?! Did she really drunk that beer?! Please say no…or maybe she fed her baby and then drunk that beer ….